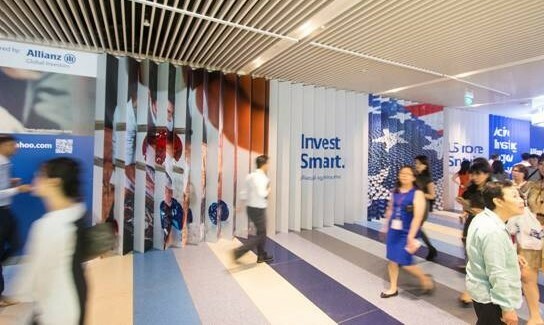 Allianz Global Investors (AllianzGI) has transformed a wallscape along the underground pedestrian walkway at Ocean Financial Centre to a lenticular “art piece”. This was done together with iNNN Creative Solutions, Carat Singapore and SPHMBO. The lenticular installation involves a series of messages, including asking consumers to “Invest Smart”, it gradually reveals itself as one walks in either direction along the walkway. Peggy Lee, managing director and chief marketing officer of Greater China and Southeast Asia, Allianz Global Investors, said that media spaces have gradually been “serving as wallpapers” to audiences in crowded areas. “Not only do we want to invite our audiences to ‘interact’ with our interesting lenticular design, we also want to encourage them to explore and discover by themselves the ‘hidden’ messages AllianzGI would like to bring out,” Lee added. "MBS is neither a hotel nor a building. Rather, it is an iconic landmark that defines a destination - Singapore - and serves as a .. Exposed datasets discovered by cybersecurity firm contain data about Facebook users, describing their interests, relationships, an..
Former AirAsia commercial director Jasmine Lee returns to the telco industry, taking on the role of director of marketing at U Mob..